For other uses of "Nectar", see Nectar (disambiguation). Nectar is a sugar-rich liquid produced by plants in glands called nectaries, either within the flowers with which it attracts pollinating animals, or by extrafloral nectaries, which provide a nutrient source to animal mutualists, which in turn provide antiherbivore protection. Common nectar-consuming pollinators include mosquitoes, hoverflies, wasps, bees, butterflies and moths, hummingbirds, honeyeaters and bats. Nectar plays an important role in the foraging economics and overall evolution of nectar-eating species; for example, nectar and its properties are responsible for the differential evolution of the African honey bee, A. m. scutellata and the western honey bee. Nectar is derived from Greek nektar, the fabled drink of Greek gods. The word is derived as a compound of nek, meaning death, and tar, meaning the ability to overcome. The common use of nectar refers to the "sweet liquid in flowers", first recorded in AD 1600. 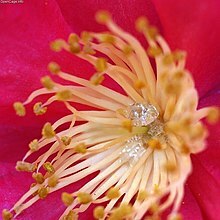 A nectary is floral tissue found in different locations in the flower. The different types of floral nectaries include sepal nectaries, petal nectaries, staminal nectaries found on the stamen, and gynoecial nectaries found on the ovary tissue. The nectaries also may vary in color, number, and symmetry. Nectaries can also be categorized as structural or non-structural. Structural nectaries refer to specific areas of tissue that exude nectar, such as the types of floral nectaries previously listed. Non-structural nectaries secrete nectar infrequently from non-differentiated tissues. The different types of floral nectaries coevolved depending on the pollinator that feeds on the plant's nectar. Nectar is secreted from epidermal cells of the nectaries by means of trichomes or modified stomata. The nectar comes from phloem with additional sugars that are secreted from the cells through vesicles packaged by the endoplasmic reticulum. Flowers that have longer nectaries sometimes have a vascular strand in the nectary to assist in transport over a longer distance..
Floral nectaries are used by plants to attract pollinators such as insects, hummingbirds, and other vertebrates. The pollinators feed on the nectar and depending on the location of the nectary the pollinator assists in fertilization and outcrossing of the plant as they brush against the reproductive organs, the stamen and pistil, of the plant and pick up or deposit pollen. 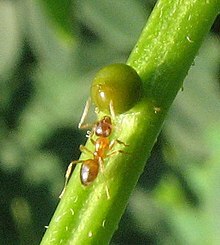 Nectar from floral nectaries is sometimes used as a reward to insects, such as ants, that protect the plant from predators. Many floral families have evolved a nectar spur. These spurs are projections of various lengths formed from different tissues, such as the petals or sepals. They allow for pollinators to land on the elongated tissue and more easily reach the nectaries and obtain the nectar reward. Different characteristics of the spur, such as its length or position in the flower, may determine the type of pollinator that visits the flower. Defense from herbivory is often one of the roles of extrafloral nectaries. Floral nectaries can also be involved in defense. In addition to the sugars found in nectar, certain proteins may also be found in nectar secreted by floral nectaries. In tobacco plants, these proteins have antimicrobial and antifungal properties and can be secreted to defend the gynoecium from certain pathogens. Floral nectaries have evolved and diverged into the different types of nectaries due to the various pollinators that visit the flowers. In Melastomataceae, different types of floral nectaries have evolved and been lost many times. Flowers that ancestrally produced nectar and had nectaries may have lost their ability to produce nectar due to a lack of nectar consumption by pollinators, such as certain species of bees. Instead they focused on energy allocation to pollen production. Species of angiosperms that have nectaries use the nectar to attract pollinators that consume the nectar, such as birds and butterflies. In Bromeliaceae, septal nectaries (a form of gynoecial nectary) are common in species that are insect or bird pollinated. 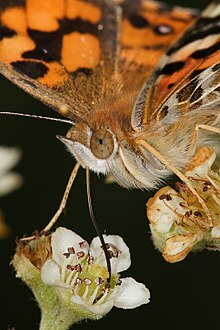 In species that are wind pollinated, nectaries are often absent because there is no pollinator to provide a reward for. In flowers that are generally pollinated by long-tongued organism such as certain flies, moths, butterflies, and birds, nectaries in the ovaries are common because they are able to reach the nectar reward when pollinating. Sepal and petal nectaries are often more common in species that are pollinated by short-tongued insects that cannot reach so far into the flower. Extrafloral nectaries (also known as extranuptial nectaries) are nectar-secreting plant glands that develop outside of flowers and are not involved in pollination. They are highly diverse in form, location, size, and mechanism. They have been described in virtually all above-ground plant parts—including leaves (in which case they are known as foliar nectaries), petioles, stipules, cotyledons, fruits, and stems, among others. They range from single-celled trichomes to complex cup-like structures that may or may not be vascularized. In contrast to floral nectaries, nectar produced outside the flower generally have a defensive function. The nectar attracts predatory insects which will eat both the nectar and any plant-eating insects around, thus functioning as 'bodyguards'. Foraging predatory insects show a preference for plants with extrafloral nectaries, particularly some species of ants and wasps, which have been observed to directly defend the plants. Among passion flowers, for example, extrafloral nectaries prevent herbivores by attracting ants and deterring two species of butterflies from laying eggs. In many carnivorous plants, extrafloral nectaries are also used to attract insect prey. Darwin understood that extrafloral nectar "though small in quantity, is greedily sought by insects" but believe the "their visits do not in any way benefit the plant". 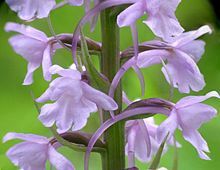 Instead, he believed that extrafloral nectaries were excretory in nature (hydathodes). Their defensive functions were first recognized by the Italian botanist Federico Delpino in his important monograph Funzione mirmecofila nel regno vegetale (1886). Delpino's study was inspired by a disagreement with Charles Darwin, with whom he corresponded regularly. Extrafloral nectaries have been reported in over 3941 species of vascular plants belonging to 745 genera and 108 families, 99.7% of which belong to flowering plants (angiosperms), comprising 1.0 to 1.8% of all known species. They are most common among eudicots, occurring in 3642 species (of 654 genera and 89 families), particularly among rosids which comprise more than half of the known occurrences. The families showing the most recorded occurrences of extrafloral nectaries are Fabaceae, with 1069 species, Passifloraceae, with 438 species, and Malvaceae, with 301 species. The genera with the most recorded occurrences are Passiflora (322 species, Passifloraceae), Inga (294 species, Fabaceae), and Acacia (204 species, Fabaceae). Other genera with extrafloral nectaries include Salix (Salicaceae), Prunus (Rosaceae) and Gossypium (Malvaceae). Foliar nectaries have also been observed in 39 species of ferns belonging to seven genera and four families of Cyatheales and Polypodiales. They are absent, however, in bryophytes, gymnosperms, early angiosperms, magnoliids, and members of Apiales among the eudicots. Phylogenetic studies and the wide distribution of extrafloral nectaries among vascular plants point to multiple independent evolutionary origins of extrafloral nectaries in at least 457 independent lineages. The main ingredients in nectar are sugars in varying proportions of sucrose, glucose, and fructose. In addition, nectars have diverse other phytochemicals serving to both attract pollinators and discourage predators. Carbohydrates, amino acids, and volatiles function to attract some species, whereas alkaloids and polyphenols appear to provide a protective function. The Nicotiana attenuata, a tobacco plant native to the US state of Utah, uses several volatile aromas to attract pollinating birds and moths. The strongest such aroma is benzylacetone, but the plant also adds bitter nicotine, which is less aromatic, so may not be detected by the bird until after taking a drink. Researchers speculate the purpose of this addition is to discourage the forager after only a sip, motivating it to visit other plants, therefore maximizing the pollination efficiency gained by the plant for a minimum nectar output. Neurotoxins such as aesculin are present in some nectars such as that of the California buckeye. Nectar contains water, carbohydrates, amino acids, ions and numerous other compounds. ^ a b c "Nectar". Online Etymology Dictionary, Douglas Harper. 2018. Retrieved 28 May 2018. ^ Willmer, Pat. Pollination and floral ecology. Princeton University Press, 2011. ^ Nicolson, Susan W., Massimo Nepi, and Ettore Pacini, eds. Nectaries and nectar. Vol. 4. Dordrecht: Springer, 2007. ^ Fahn, Abraham. “On the Structure of Floral Nectaries.” Botanical Gazette, vol. 113, no. 4, 1952, pp. 464–470. JSTOR, JSTOR, www.jstor.org/stable/2472434. ^ Wallace, Gary D. "Studies of the Monotropoideae (Ericaceae). Floral nectaries: anatomy and function in pollination ecology." American Journal of Botany (1977): 199-206. ^ Heil, Martin. "Nectar: generation, regulation and ecological functions." Trends in plant science 16.4 (2011): 191-200. ^ Pacini, E. N. M. V. J., M. Nepi, and J. L. Vesprini. "Nectar biodiversity: a short review." Plant Systematics and Evolution 238.1-4 (2003): 7-21. ^ Thornburg, Robert W., et al. "A major function of the tobacco floral nectary is defense against microbial attack." Plant Systematics and Evolution 238.1-4 (2003): 211-218. ^ Stein, Bruce A., and Hiroshi Tobe. "Floral nectaries in Melastomataceae and their systematic and evolutionary implications." Annals of the Missouri Botanical Garden (1989): 519-531. ^ Floral anatomy of Bromeliaceae, with particular reference to the evolution of epigyny and septal nectaries in commelinid monocot, Sajo, M. G., P. J. Rudall, and C. J. Prychid. "Floral anatomy of Bromeliaceae, with particular reference to the evolution of epigyny and septal nectaries in commelinid monocots." Plant Systematics and Evolution 247.3-4 (2004): 215-231. ^ Rudall, Paula J., John C. Manning, and Peter Goldblatt. "Evolution of floral nectaries in Iridaceae." Annals of the Missouri Botanical Garden (2003): 613-631. ^ a b Heil, M.; Fiala, B.; Baumann, B.; Linsenmair, K.E. (2000). "Temporal, spatial and biotic variations in extrafloral nectar secretion by Macaranga tanarius". Functional Ecology. 14 (6): 749. doi:10.1046/j.1365-2435.2000.00480.x. ^ a b c d e Weber, M. G.; Keeler, K. H. (2012). "The phylogenetic distribution of extrafloral nectaries in plants". Annals of Botany. 111 (6): 1251–1261. doi:10.1093/aob/mcs225. PMC 3662505. PMID 23087129. ^ a b Sezen, Uzay. "Ants defending extrafloral nectaries of the passion flower (Passiflora incarnata)". Retrieved 6 January 2012. ^ Merbach, M. 2001. Nectaries in Nepenthes. In: C.M. 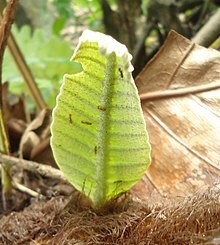 Clarke Nepenthes of Sumatra and Peninsular Malaysia. Natural History Publications (Borneo), Kota Kinabalu. ^ a b Mancuso, S. (2010). "Federico Delpino and the foundation of plant biology". Plant Signaling & Behavior. 5 (9): 1067–1071. doi:10.4161/psb.5.9.12102. PMC 3115070. PMID 21490417. ^ Chalcoff, Vanina (March 2006). "Nectar Concentration and Composition of 26 Species from the Temperate Forest of South America". Annals of Botany. 97 (3): 413–421. doi:10.1093/aob/mcj043. PMC 2803636. PMID 16373370. ^ a b González-Teuber, M.; Heil, M. (2009). "Nectar chemistry is tailored for both attraction of mutualists and protection from exploiters". Plant Signaling & Behavior. 4 (9): 809–813. PMC 2802787. PMID 19847105. ^ a b c Nicolson, Susan W.; Nepi, Massimo (2007). Pacini, Ettore (ed.). Nectaries and Nectar; Nectar Components. Springer Publications. pp. 8–9. ISBN 9781402059377. Baker, H.G. ; Baker, I. (1973). "Amino acids in nectar and their evolutionary significance". Nature. 241 (5391): 543–545. doi:10.1038/241543b0. Baker, H.G. and Baker, I. (1981) Chemical constituents of nectar in relation to pollination mechanisms and phylogeny. In Biochemical aspects of evolutionary biology. 131–171. Baker, H.G. and Baker, I. (1975) Studies of nectar-constitution and pollinator-plant coevolution. In Coevolution of animals and plants. Gilbert, L.E. and Raven, P.H. ed. Univ. of Texas Press, Austin, 100–140. Beutler, R. (1935) Nectar. Bee World 24:106–116, 128–136, 156–162. Burquez, A.; Corbet, S.A. (1991). "Do flowers reabsorb nectar?". Funct. Ecol. 5 (3): 369–379. doi:10.2307/2389808. JSTOR 2389808. Carter, C.; Graham, R.; Thornburg, R.W. (1999). "Nectarin I is a novel, soluble germin-like protein expressed in the nectar of Nicotiana sp". Plant Mol. Biol. 41: 207–216. Deinzer, M.L. ; Tomson, P.M.; Burgett, D.M. ; Isaacson, D.L. (1977). "Pyrrolizidine alkaloids: Their occurrence in honey from tansy ragwort (Senecio jacobaea L.)". Science. 195 (4277): 497–499. doi:10.1126/science.835011. Ecroyd, C.E. ; Franich, R.A.; Kroese, H.W. ; Steward, D. (1995). "Volatile constituents of Dactylanthus taylorii flower nectar in relation to flower pollination and browsing by animals". Phytochemistry. 40 (5): 1387–1389. doi:10.1016/0031-9422(95)00403-t.
Esau, K. (1977) Anatomy of seed plants. John Wiley & Sons, New York. Ferreres, F., Andrade, P., Gil, M.I. and Tomas Barberan, F.A. (1996) Floral nectar phenolics as biochemical markers for the botanical origin of heather honey. Zeitschrift fur Lebensmittel Untersuchung und Forschung. 202:40–44. Frey-Wyssling, A. (1955) The phloem supply to the nectaries. Acta Bot. Neerl. 4:358–369. Griebel, C.; Hess, G. (1940). "The vitamin C content of flower nectar of certain Labiatae". Zeit. Untersuch. Lebensmitt. 79: 168–171. Heinrich, G (1989). "Analysis of cations in nectars by means of a laser microprobe mass analyser (LAMMA)". Beitr. Biol. Pflanz. 64: 293–308. Heslop-Harrison, Y.; Knox, R.B. (1971). "A cytochemical study of the leaf-gland enzymes of insectivorus plants of the genusPinguicula". Planta. 96 (3): 183–211. doi:10.1007/bf00387439. PMID 24493118. Peumans, W.J. ; Smeets, K.; Van Nerum, K.; Van Leuven, F.; Van Damme, E.J.M. (1997). "Lectin and alliinase are the predominant proteins in nectar from leek (Allium porrum L.) flowers". Planta. 201 (3): 298–302. doi:10.1007/s004250050070. PMID 9129337. Rodriguez-Arce, A.L. ; Diaz, N. (1992). "The stability of beta-carotene in mango nectar". J. Agric. Univ. P.R. Rio Piedras, P.R. 76: 101–102. Roshchina, V.V. and Roshchina, V.D. (1993) The excretory function of higher plants. Springer-Verlag, Berlin. Scala, J.; Iott, K.; Schwab, W.; Semersky, F.E. (1969). "Digestive secretion of Dionaea muscipula (Venus's-Flytrap)". Plant Physiol. 44 (3): 367–371. doi:10.1104/pp.44.3.367. PMC 396093. PMID 16657071. Smith, L.L. ; Lanza, J.; Smith, G.C. (1990). "Amino acid concentrations in extrafloral nectar of Impatiens sultani increase after simulated herbivory". Ecol. Publ. Ecol. Soc. Am. 71: 107–115. doi:10.2307/1940251. JSTOR 1940251. Vogel, S. (1969) Flowers offering fatty oil instead of nectar. Abstracts XIth Internatl. Bot. Congr. Seattle. Wikimedia Commons has media related to Nectar.